Prom Pick & Mix is now available in the salon. Book now in to avoid disappointment. 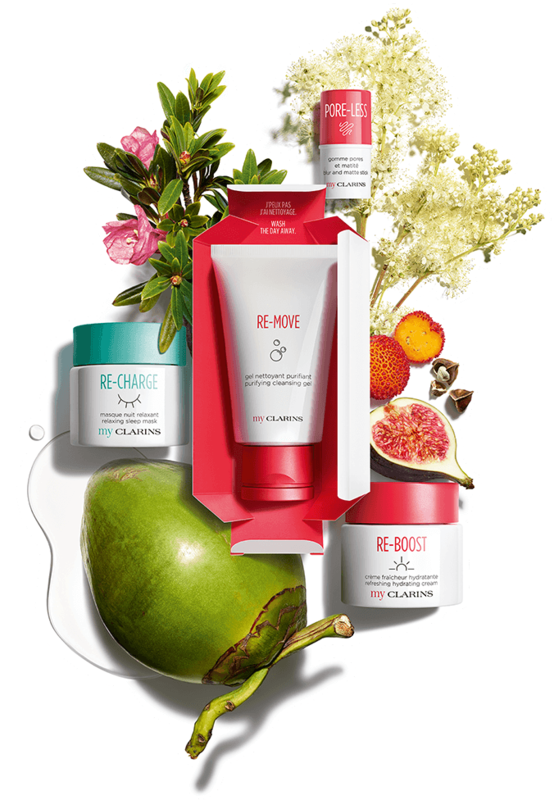 On average, 88% ingredients are natural origin ingredients in the My Clarins range. What does the remaining 12% represent? The remaining 12% are synthetic (betaine, chrysin, salicylic acid) and present only in Clear-Out and Pore-Less products. Clains has always been inspired by nature to offer high-quality products to women and encourage the use f natural origin ingredients in its products, while prioritising safety, effectiveness and tolerancde of the products. What is the benefit of coconut water used in My Clarins skin care? It comes from Brazil and is harvested when the coconut is young and green, in other words, when its water is richest in essential nutrients (vitamins and minerals), which improves skin cell nutrition. What is the Anti-Pollution Complex? The Anti-Pollution complex helps limit the interaction of pollution with the skin’s surface. It reduces the oxidative stress generated by the harmful effects of pollution. Why is the Anti-Pollution Complex included in the night mask? Clarins incorporates its Anti-Pollution Complex into its night care to help skin to defend itself against the harmful effects of pollution from our internal environments, including external pollution that enters our homes and offices. In fact, as Clarins Research has shown, indoor pollution can impair skin and weaken it. Can you use Micellar Cleansing Milk to move eye make-up and waterproof make-up? This product has been ophthalmologically & dermatologically tested, inluding around the eye contour area. It removes make-up from face, eyes and lips. Lovely to see Ashley back and she’s done a fab job as usual. Highly recommend!